On this joyous occasion when we look at the role played by the Eastern Cape in the establishment and growth of the BBSA, there is an element of sadness when we realize that many of our greatest role players are no longer with us. This is particularly so for me, since they include my grandfather Isaac Hitzeroth, my father James, and my uncle Henry. Isaac Hitzeroth served on the first executive of the BBSA. Henry Hitzeroth also served on the executive of BBSA for a number of years. Although James Hitzeroth never served on the executive, he was the bandleader of Salem for many years, and was often called upon to assist bands of other congregations. He also formed the first and only all girl band in the BBSA in 1976 and this paved the way for the girl power, which we now witness in BBSA. Up until then our bands were virtually for men only. If I started on a personal note it is not elevate the importance of the role played by my family in the BBSA. It is rather an acknowledgement that I am what I am because of where I come from. The greatest role players were undoubtedly the Balie brothers. Rudolf and Michael. Not only were they at the heart of the founding of BBSA, but they also gave many years of dedicated service. 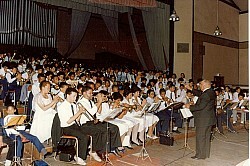 Regular brass band festivals were held in those formative years. Rev. Rudolf Balie also later played a prominent role in organizing BBSA in the Western Cape in the 1960’s. By the time Michael Balie finally retired in 1987 and I took over from him as chairman of the Eastern Cape Branch, the BBSA was a well-oiled machine. All the hard work had been done and all that was required was constant care and some fine-tuning. By this time Harry Karmineth had also left his mark in the BBSA before his tragic death at an early age. Other prominent leaders were people like Brs. Willie Kiviets, Dan Kivido, Ben Botha, Willie Mlando, Mlandeli Silinga, Bennie Bans, Simon Africa, Martin Baadjies and Simon Fox. In the early days music for our bands were not readily available and bandleaders mostly had to write out music themselves without the benefit of photocopy machines. Mr Balie used to write music for brass band festivals on stencil. A current leader who deserves special mention is Mary-Ann Njeje from Mvenyane. She has been serving the church in this capacity for a very long time, and carries a heavy personal financial burden in trying to keep the brass band going in Mvenyane against the odds. The only foundation member still playing is Mintoor Munnik. He started with Willowdene in 1946 and now plays in a veteran’s band at Salem. Martin Baadjies still assists with teaching on request. We also take pride in the fact that three of our members went on to enter the ministry, namely Brs. F. Moos, E. Moos and H. Houlie. We must however not underestimate the roles played by our foot soldiers, the ordinary players who gave many years of faithful service. In the final analysis the growth and sustainability of BBSA is not so much dependent of musical leadership, as on tradition. In this regard families played an important role for a number of generations. We think of families like the Kivido’s, Botha’s, Newfeldts, Africas, Princes, Houlies, Banses, Cunninghams, Jonases, Browns, Kamineths and others. They have all helped to sustain this wonderful Moravian tradition of brass playing. With God as our focus, our standard of play has improved consistently over the years. When BBSA became unified we were able to contribute dedicated leadership to the national cause. We played a full role in the two BBSA tours to Germany in 1987 and 2000, and on each occasion the tour-leader (manager) was from the Eastern Cape, with the Western Cape supplying the conductor. We also produced the first band at congregational level, Salem, to tour Germany on its own. In the 1980’s we set an example for the rest of our church when we reached out to the brass bands of the old South Africa Eastern Region and accepted them as full members of the Eastern Cape Branch of BBSA. Our players throughout BBSA now stand on the threshold of taking their rightful place on the musical stage of South Africa. As proud as we are of our achievers and of ourselves for producing them, we would do well to remember where we all come from. If it were not for our wonderful tradition we would probably not even have had the opportunity of discovering our rich talents. As we continue to strive to be the best that we can be, we should remember that the challenge is not a musical one. As the oldest and probably the biggest brass band movement in the country, it is natural that with proper guidance we should produce some of the top players in the country. The challenge is therefore to remain focused and continue to play for the glory of God. This alone will sustain us and keep us growing. May we therefore, in this time of change, remain true to our wonderful tradition and may our descendants be amongst those who celebrate the centenary of BBSA in 50 years time.